Location: Phong Nha-Ke Bang National Park is located to the north of the majestic Truong Son Range in central Quang Binh Province. Characteristics: Phong Nha - Ke Bang is ancient karst area of the highest significance and value in both Vietnam and the world. Phong Nha-Ke Bang National Park is one of the world's two largest limestone regions, and it has been recognised as a world natural heritage site by the United Nations Educational, Scientific and Cultural Organisation (UNESCO) at its 27th general assembly session being held in Paris from June 30-July 5, 2003. At the session, delegates from over 160 member countries of UNESCO World Heritage Convention agreed to include Phong Nha - Ke Bang Park and 30 others worldwide to the list of world heritage sites. Phong Nha - Ke Bang Park is now the fifth UNESCO recognised site in Vietnam after Halong Bay, Hue Imperial City, Hoi An Ancient Town and My Son Cham Towers. The over 200,000 ha of parkland includes beautiful limestone formations, grottoes and caves, and boasts lush forestland covering 95 percent of the park area. The area is considered a paradise for researchers and explorers of grottoes and caves, and Vietnamese and British scientists have so far surveyed 20 with a total length of 70km. 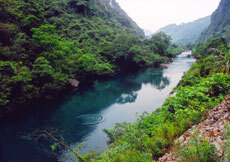 Of them, 17 are in the Phong Nha area and three in the Ke Bang Area. The Phong Nha Grotto itself which lends its name to the whole system is probably the most beautiful of all, containing many fascinating rock formations, enchanting visitors with evocative names such as Lion, Fairy Caves, Royal Court and Buddha. Besides the grotto and cave systems, Phong Nha has the longest underground rivers, the largest caverns and passageways, the widest and prettiest sand banks, and the most astonishing rock formations in the world. According to initial statistics, the primitive tropical forest in Phong Nha - Ke Bang houses 140 families, 427 branches, and 751 species of high-rated plants, of which 36 species are endangered and listed in the Vietnam Red Book. The forest is also home to 32 sets, 98 families, 256 races and 381 species of four land backboned animals. Sixty-six animal species are listed in the Vietnam Red Book and 23 other species in the World Red Book. Phong Nha - Ke Bang also boasts dozens of mountain peaks of over 1,000 metres still unexplored by men and seen as ideal sites for activities like climbing and exploration. Worthy of note are Peak Co Rilata with the height of 1,128m and Peak Co Preu, 1,213m. Lying between these peaks are valleys which promise tourists exciting eco-tours. 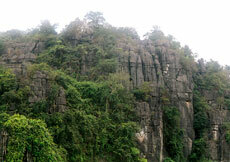 In addition to the diversity in the ecosystem, Phong Nha - Ke Bang is home to archeological and historical relics, such as an ancient hieroglyphic script of the Cham ethnic minority, King Ham Nghi's base built for the resistance war against French colonialists in the late 19th century, and the Xuan Son ferry station, Ho Chi Minh Trail and Road 20 used during the US resistance war. Central Quang Binh Province has poured heavy investment into upgrading the Phong Nha - Ke Bang visitor site to turn it into the country's major tourist destination.